Some fifteen months ago I wrote to you to announce Mark Murphy’s upcoming retirement from The Prairie School in June 2014. That time is nearly upon us, so it is appropriate and fitting that we take a look back and commemorate Mark’s wonderful legacy and accomplishments at the School — to offer at least a small picture of the lives that Mark has touched, inspired, nurtured, and transformed at Prairie. Mark has led Prairie with vision, purpose, commitment, and passion. His deep and steadfast concern for the whole being of every student, his unwavering support of the School’s faculty and staff, and his understanding of education as a holistic concept and endeavor have fortified and strengthened Prairie’s commitment to developing each student’s mind, heart, body, and soul to his or her fullest potential. This is why Prairie students are so well prepared to become leaders of their lives, their communities, and the world. Over the years, Mark has introduced, championed, and directed numerous advancements which have made our learning community and environment better and stronger, and have garnered national recognition for Prairie as a role model in the world of education. This booklet represents a brief retrospective on Mark’s amazing and groundbreaking tenure at Prairie. Of course, truly depicting Mark’s wonderful accomplishments and legacy at Prairie would require a book of several hundred pages! On behalf of my colleagues on the Board of Trustees, please join me in celebrating all that Mark has done to make The Prairie School the truly outstanding School that it is today. Please join us, too, in wishing Mark and Gracie well as they depart for what is sure to be an exciting new chapter of their lives. Click on the expand button [+] to view each quote. 21 Years of Service onDipity. This June, William Mark H. Murphy, Prairie’s fourth headmaster will lead his 21st and final commencement. I remember hearing Mark’s reedy voice on the line when he invited me to interview for director of college counseling in 1994, one year after he joined the School. When I accepted his job offer a short while later, I knew I liked him, but had no idea what a talented and energetic headmaster I would serve. A good headmaster must be kind and compassionate, and yet, he or she must also be resilient and determined. Mark’s childhood imbued him with all those qualities and more. 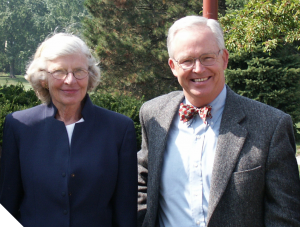 Always mindful of founder Gene Johnson’s overarching vision, Mark led Prairie to a path that articulated the Early School through 12th curriculum. He improved and streamlined instruction and the school’s instructional model. 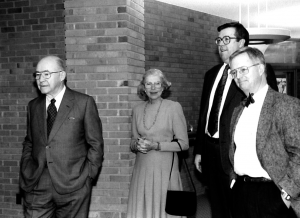 He broadened support for students with learning differences, increased enrollment, increased the endowment, and expanded and upgraded the School’s facilities. Inspired by Gene, guided by the Board of Trustees, and supported by the faculty and staff, Mark led The Prairie School to milestones of success after success. artistic, athletic, altruistic, active, accountable, and adaptable future leaders. The values were and are a schoolwide consensus about what each child should experience. This also led to the creation of the CAIT (Curriculum, Assessment, Instruction and Technology) program, which identifies and organizes what students should know and be able to do upon graduation (Graduation Standards) or upon moving from one division to another (Transition Standards). The result: a published, agreed-upon, articulated, technology-enhanced, and differentiated curriculum learning assessment model throughout all fifteen grades. Under Mark’s watch, Prairie refocused and expanded its math and science curricula to include a combined 19 offerings, serving interested students of different abilities and strengths. The School has improved its science labs to match the strength of its classes in that discipline. This summer the school will replace the four original science laboratories to fulfill the 21st-century requirements of science education. As Prairie brought in more traditionally gifted students through the IPJ and Hilpert Scholars Programs, it fortified the Compass Program, to ensure that the School and its faculty were positioned to “teach each child to learn best the way each learns best.” This educational equity has differentiated The Prairie School since its inception, and it is close to the hearts of both Gene Johnson and Mark. Combining the services of a nurse, school counselor and learning specialists as a strong, professional team, the Compass Team now consists of professionals who address students’ health and learning differences, The team not only helps our students meet a wide variety of challenges, but they provide expertise for the faculty as they help these children learn more effectively. In fundraising and new program development, Mark successfully led the campaigns to earn three significant grants from the Edward E. Ford Foundation, the nation’s preeminent supporter of independent School education. The foundation’s grant criteria are the most specific and challenging in the industry. Schools must demonstrate excellence in every area of operation, education, fiscal responsibility, and community support. The first grant funded efforts and advances in the use of educational technology. The second secured support for the School’s renowned faculty professional and personal enrichment program. Then, based on the success in obtaining and implementing the original grants, the E.E. Ford Foundation invited Prairie to vie for a $250,000 Educational Leadership Grant. Mark worked closely with trustees and others to create a vision for an experiential math-and-science-centered summer program that would better serve and prepare students from southeastern Wisconsin in math and science. The E.E. Ford Foundation was impressed, and with the support of Charles and Jennifer Johnson and other community leaders who met the challenge grant, Prairie now hosts its Center for Developing Excellence (CDE), serving students going in grades 6-9. Having achieved those grants, Prairie was invited to compete nationally for a prestigious Malone Foundation grant of $2,000,000 to fund exceptional students whose talents and abilities earned them recognition and whose families demonstrated the need for substantial financial assistance in order to attend the School. The School currently enrolls seven Malone Scholars. Prairie’s campus has changed significantly during Mark’s tenure. Most notably, the Samuel C. Johnson Upper School was built in 1995 to house increasing enrollment. In 2005 the Johnson Athletic Center (JAC) was added, using funds from the very successful Legacy of Leadership Capital Campaign. The JAC accommodates the growth and quality of the School’s athletic programs, and its state-of-the-art facilities have positioned the Hawks to reach unprecedented levels of success in regional and state tournament play. This summer the School will replace the current soccer field with The Ruud Family Soccer Complex, wherein The Osiecki Family Soccer Field will feature an artificial playing surface, new stands, team enclosures, and architecturally enhanced fencing and lighting. Prairie’s excellent music and theatre programs enjoy the recently completed renovation and restoration of the Jack Mitchell Theatre. Sweeping improvements to the theatre program have also resulted in outstanding productions and have stimulated greater statewide recognition of the performing arts program. With so many terrific things happening at Prairie, and especially with the leadership of key trustees and community leaders — including Dennis Axelson, Patrick O’Brien, John Gittings, Bill Nahikian, Rick Fiegel, Brian Ketterer, John Batten, Greg Mueller, Chris Kann and Ray Farley — confidence in and excitement about the School grew. All of the above have triggered increased giving to the annual fund, special projects, and the School’s endowment. Enrollment grew from 477 in 1993, the year before Mark came, to its current level of 678 students. What an accomplishment! For his part, Mark simply observes that he is pleased “to have been able to help the School achieve its potential and to become a place that that nutures the individuality and gifts of each child.” He has, of course, done that and much more, but you will never hear him take credit for it. What is next for the bow-tied dynamo? Racine will remain his family’s home. 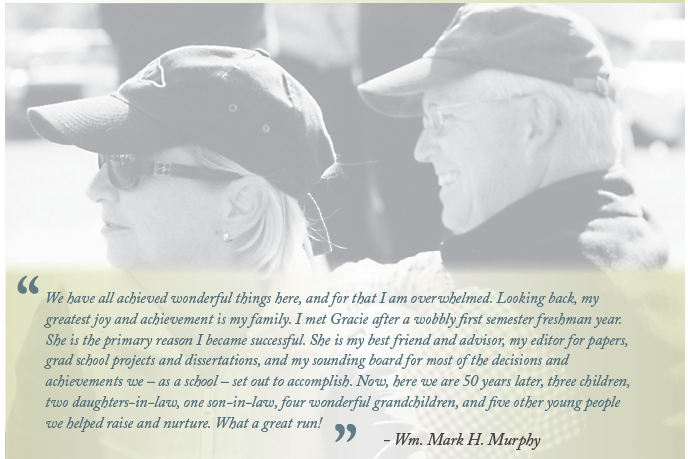 However, Mark and Gracie plan on an energetic and engaged retirement, featuring more time for family and travel, especially to his beloved Ireland and his family’s home in Canada. He also looks forward to continuing his strong personal friendship with Gene Johnson, a relationship that will go way beyond his time at the school. Good luck and Godspeed, Mark Murphy. We wish you well. This entry was posted in All News, All School, Head of School by Communications Department. Bookmark the permalink.